Leonard Nimoy passed away last week. We knew and loved him best as Mr. Spock. Mr. Logic. Mr. green-blooded, pointy-eared, emotionless, smarty-pants. We watched as he refused to acknowledge his human half, denying any emotion he may or may not have had. When “Star Trek: The Next Generation” came on the scene it was interesting to see how the new characters they introduced dealt with the human condition, especially in relation to emotions. We had two characters on opposing ends of the spectrum: Data who, as a robot/android had NO emotions and trying so hard to become a real boy, and then you had Deanna Troi, an empathic, who was a walking therapist, tapping into everyone’s emotions. She never had to ask, “So, how do you FEEL about that?” because she was swimming in it. Two “aliens” trying so hard to show us episode after episode what it meant to be human; to feel pain and love and make mistakes and how it was okay, that it was all okay and preferable to the alternative. As much as I loved TNG, my heart always belonged to the original, to Spock and even to the halting speech patterns of Captain Kirk. I loved the sparring between the ill-tempered doctor and the maddening logical 1st officer. The three of them – Spock, Kirk, and McCoy – aptly exemplified the real human condition. Our strive for logic and trying to move away from too much emotion, our tendency to get pissed off at everyone and everything just because the people around us are just plain annoying as all get out, and then the middle-of-the-road leading man himself, leaning on logic on the one hand and yet knowing when to tap into just enough of the righteous indignation on his other hand. Spock taught us more about humanity than all of the other characters combined. I don’t remember a dry eye in the theater when Spock died in “The Wrath of Khan.” What better epitomizes humanity than real love and sacrifice? What better mantra than the needs of the many outweigh the needs of the few – or the one? That scene was a coming of age moment for me. I was embarking on adulthood and a symbolic ending of my childhood. I grew up with Spock and Uhura and Chekov (and crewman number 5 who always managed to get himself whacked in the first scene.) You always knew who was and wasn’t going to make it and in those days the big guns, the main characters, ALWAYS made it. So when we were comfortably sitting in the velvety theater chairs and we saw the barrier of glass between Kirk and Spock and knew what Spock was doing and that Kirk couldn’t get in to save him . . . oi vey . . . Kirk and Spock’s emotion-wrenching, last-conversation-on-earth dialogue was a kick in the gut, a betrayal to our childhood fantasy that people who mean the most to us can’t die, don’t die, or won’t leave us. It was a divergence from the patterns we grew to rely on in our break from reality. But Spock did leave us that day, and our illogical selves (because we KNEW it was a movie and he was a character from a TV series) mourned his passing. But even as we exited the theater, moved from the darkened room into the bright lights of candy and popcorn counters we breathed a wistful sigh of relief. We knew it wasn’t real and thank goodness we could walk into the light and know that it was all pretend. They had to bring Spock back. We HOPED they would bring Spock back in a later movie. And they did. We wanted it so much, too much. If they couldn’t bring back our childhood we could at least maintain that childlike wonder of fantasy, of bringing back someone we loved even if defied our day-to-day adult logic. But now, we have no choice but to say goodbye to our childhood, to own up to the fact that there are no shiny candy and popcorn counters waiting outside, no sigh of relief that it was really only a movie playing on our emotions. 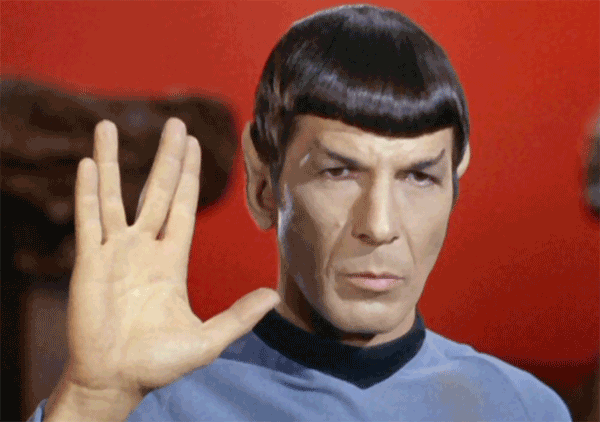 There will be no sequels or yet another resurrection of the original Spock. Leonard Nimoy, as Spock you taught us about loyalty and love and sacrifice – and pain. Without trying, and with wardrobe no fancier than pointy ears and a bad haircut, you had our hearts and our attention. You had a generation practicing not only the “live long and prosper” hand sign but believing we really could knock out our little sister with a Vulcan death pinch. The illogical side cheered us on, chanting in our brains, “It will work! It will work!” But it is the logical side that watches, silent and impassionate, as that same little sister, now thoroughly annoyed, swings around and lands one believable punch right in the nose. You taught us episode after episode what it really meant to be human; that not only is it logical but expected to feel pain and love and make mistakes. Mr. Nimoy, through the actions of the one, you impacted the hearts of the many. Thank you Rachel! I was so sad too. Letting go of another part of my childhood . . . I enjoyed the story as much as I liked Star Track. I LOVED Star Trek!! Thanks for popping in Ross.